When the temperatures start to plummet that doesn’t mean your performance also has to, with any product aimed at fighting the cold always a welcome addition. 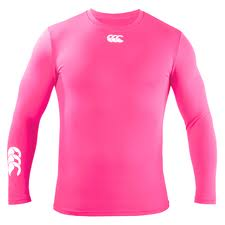 The Canterbury Base Layer Cold LS T-shirt is a performance garment especially designed for the physical demands of rugby players, keeping you warm even in the coldest temperatures. Made from 65% nylon, 21% polyester and 14% lycra, this garment is designed to be lightweight and comfortable, acting as a second skin during any activity whilst ensuring a quick drying time when not in use. The specially formulated fabrics generate pro-active insulation for cold environments whilst an anti chill factor maintains a constant body temperature. The evaporation of sweat is also boosted to wick moisture away from the skin, keeping you dry and comfortable whatever your activity. As an added touch, the anti-bacterial fabric keeps you fresh up until the final whistle; no matter how strenuous your activity. A powerful plain red offering features the Canterbury CCC logo printed in white beneath the round-neck collar and at the bottom of the right arm. Tried and tested to cope with life on the rugby field, Canterbury know how to keep you warn in the coldest conditions.